Imagine a future in which we can edit genes like a sentence in Microsoft Word. We could highlight, delete, and correct a section of a gene known to cause disease, virtually eliminating the devastating genetic illnesses that cost the world billions of dollars and countless hours of heartache every year. This is a future envisioned by many scientists working on the CRISPR-Cas9 system of gene editing. These researchers have used the technology to cure everything from liver disease to cataracts in mice. Ethical concerns have limited these experiments to model organisms and until recently, on-demand gene editing in humans seemed like more of a science fiction fantasy than a potential reality. All of that appears to have changed, however, with a Chinese scientist named He Jiankui claiming to have successfully used CRISPR to delete an HIV-related gene in two human babies late last year. This claim has stirred up quite a bit of controversy, to put it lightly, in the scientific community, but why is it such a big deal? Let’s take a closer look at the experiment and the hopes and concerns it brings to light. 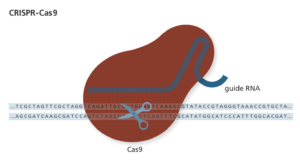 CRISPR, short for CRISPR-Cas9, stands for “clusters of regularly interspaced palindromic repeats.” The major player in the CRISPR system is Cas9, which is a protein that acts like molecular scissors to chop up DNA. This system first evolved as a bacterial defense mechanism that targeted Cas9 to common sequences found in viruses, allowing the bacteria to chew up viral DNA and prevent infection. However, scientists then discovered that Cas9 could be targeted to just about any sequence of DNA they wanted. The secret lies in how Cas9 targets specific DNA sequences: the protein works together with a piece of RNA called guide RNA that matches up to the target DNA sequence. Modify this RNA and you can cause Cas9 to cut up whatever DNA you choose. Thanks to DNA repair, scientists can even provide a template sequence, say to correct a bad version of the gene, that can be incorporated into the DNA cut by Cas9 to fix a genetic mutation. These manipulations can be done in cells in a dish or even by injecting the CRISPR components into animals. 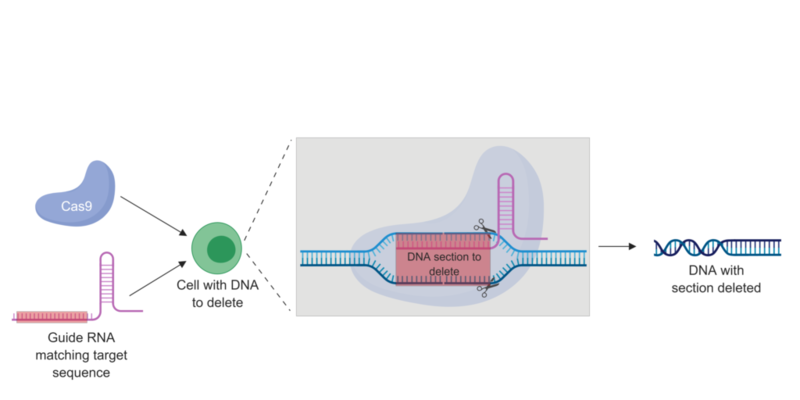 An overview of using CRISPR to delete a segment of DNA. Made using biorender.io. Until last November, using CRISPR to induce inheritable changes in live organisms was restricted to animals like fruit flies and mice. However, on November 26, 2018, the Associated Press reported that Chinese scientist He Jiankui claimed to have successfully used CRISPR to delete a gene associated with HIV infection in two human embryos. The edited embryos were created using in vitro fertilization (IVF), checked for successful editing after CRISPR treatment, and implanted back into the women who donated them. Allegedly, the edited embryos resulted in the birth of healthy twin girls. The gene Jiankui claims to have deleted encodes the protein CCR5, a human cell surface receptor that the HIV virus requires to infect immune cells. Essentially, deletion of CCR5 results in no HIV infection. This manipulation, Jiankui says, could protect the children from acquiring HIV and has broad implications for the management of HIV from a public health perspective. From a basic science perspective, the birth of children from CRISPR-edited embryos is an incredible achievement. However, as with almost every method of genome editing, the ethical controversy of Jiankui’s work has become just as important as the scientific implications. One of the largest outstanding questions surrounding the alleged CRISPR babies is the fact that they are just that: alleged. Jiankui has not published the results of his manipulations in a peer-reviewed scientific journal and the identities of the children’s parents have been kept private to protect them from media scrutiny and potential backlash. However, let’s say that Jiankui actually did successfully delete the CCR5 gene in embryos that went on to become healthy human babies. What’s the problem with that? First, although some people have naturally occurring mutations that inactivate CCR5, the changes that Jiankui made in the embryos do not appear to mimic those natural mutations, leading to concerns about potential unintended consequences. Additionally, a well-known issue with CRISPR is its potential for off-target effects, or making changes in genes other than the targeted one. Finally, even if CCR5 was correctly inactivated with no off-target effects, the naturally occurring inactivating CCR5 mutations have been shown to have negative health effects, such as increasing the risk for infection and complications of West Nile virus. The scientific consensus is that using CRISPR to make such drastic, inheritable changes is unsafe simply because we don’t know enough about it yet. Ethically, a large concern with gene editing in humans is the old slippery slope argument: if we can delete disease-causing genes, what’s to stop people from editing embryos to select for traits like eye color or intelligence? Along the same lines, proponents of CRISPR gene editing in humans speak of “curing” conditions with a probable genetic basis like autism. However, advocacy organizations like Autism Speaks say this is a fundamental misunderstanding of this complex condition and that many people with autism view it as an inextricable part of themselves, not a disease to be cured. For these reasons and more, the larger scientific community has condemned Jiankui’s alleged experiments as risky and unethical. More extensive experiments in model organisms and strict ethical guidelines are needed before scientists can even think about bringing CRISPR into the mainstream. Although this technology seems like it could be a magic bullet for genetic editing, it’s clear that the way forward is uncertain and each new advance creates more questions than it does answers. For now, at least, a world of CRISPR on-demand is still a distant future. Peer edited by Rachel Battaglia and Breanna Turman. CRISPR-Cas9, more commonly referred to as CRISPR, has been one of the hottest terms in science over the last few years. For goodness sake, Jennifer Lopez is the executive producer of the prospective NBC bio-terror drama CRISPR, which is centered around the gene-editing technique. Starting in 2012, CRISPR began its rise to becoming the newest and most promising gene-editing tool. It has since transformed the way many labs conduct research and has turned into a multi-billion dollar industry. Even though CRISPR has become more mainstream with seemingly limitless applications, recent research has shown we must move forward cautiously and be patient as this technology matures. CRISPR Therapeutics currently is the largest biotechnology company that specializes in gene editing via CRISPR. After initially opening at $15 per share on October 19, 2016, CRISPR Therapeutics climbed to $74 per share and had a market cap of $3.47 billion on May 30, 2018. The company’s surge was in response to their announcement in April 2018 that they were moving forward with an Investigational New Drug (IND) application with their partner Vertex Pharmaceuticals Inc. The two companies also had plans to start a Phase 1/2 clinical trial to treat adults with sickle cell disease using CRISPR gene-editing technology in both the United States and Europe. On May 30, 2018, CRISPR Therapeutics announced that the FDA put a clinical hold on its IND application pending the resolution of certain questions by the FDA. The announcement offers no insight into the questions or concerns of the FDA, but this news was enough to spook investors. CRISPR Therapeutics’ stock fell 20.2% in June and 19.1% in July. Currently, it is trading about $48 per share and its market cap is valued at $2.295 billion. Only part of the CRISPR Therapeutics decline can be attributed to the FDA’s announcement. Three separate studies published this summer negatively influenced investors outlook on CRISPR Therapeutics, as well as the two other major biotechs specializing in CRISPR, Editas Medicine and Intellia Therapeutics. The first study, which was published June 11 in Nature Medicine, highlights how double stranded breaks in DNA caused by Cas9, the molecular scissors of the CRISPR-Cas9 system, are toxic to human pluripotent stem cells (hPSCs). hPSCs, cell lines similar to an early embryo that are capable of differentiating into other cell types, depend on the tumor suppressor protein p53 for its toxic response to prevent growth of aberrant cells. Given that p53 mutations are prevalent in hPSCS, there is also a concern that hPSCs engineered using CRISPR-Cas9 could cause cancer. A second study, published in the same issue of Nature Medicine on June 11, used human retinal pigment epithelial cells and reached a conclusion similar to the previous study, CRISPR-Cas9 induces a p53-dependent DNA damage response. In addition, this group also found CRISPR-Cas9 causes cell cycle arrest. Both studies clearly indicate that it is crucial to monitor p53 function when developing cell-based therapies using CRISPR-Cas9. A third study, published July 16 in Nature Biotechnology, further casts a cloud of uncertainty over CRISPR. This study revealed that CRISPR-Cas9 causes “significant on-target mutagenesis, such as large deletions and more complex genomic rearrangements at the targeted sites in mouse embryonic stem cells, mouse hematopoietic progenitor and a human differentiated cell line.” Even though these three articles were all released in the last two months and were the primary reason investors in CRISPR-based companies have been more reluctant to invest, two other studies also show negative effects of CRISPR. One shows an adaptive immune response to Cas9 and the other shows major genomic rearrangements from in a mouse model following the use of CRISPR-Cas9 also show negative effects of CRISPR. Even though it has been a disappointing summer for companies specializing in CRISPR, CRISPR Therapeutics, Editas Medicine, and Intellia Therapeutics remain adamant that the future looks bright. For many people, these studies might be more a speed bump rather than a road block. Peer edited by Justine Grabiec.